If you need LED Strip to use in a harsh environment then this could be the solution. The LED Strip is fully enclosed in a flexible PVC making it completely weathertight. It's a complete 20m kit of IP67 superbright, fully encapsulated low voltage LED Strip with an IP67 waterproof power supply. The power supply has waterproof connectors which push together and then lock in place to form a secure and waterproof joint between the power supply and the TuffStrip Pro. 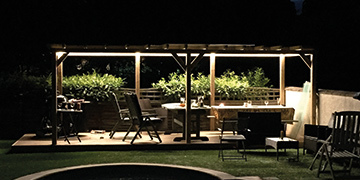 TuffStrip Pro has a design which is completely different to standard LED Strip - this means that a single run of 20m is possible without significant voltage drop along the length making it perfect for walkway or site illumination. The LED Strip is easy to install - all the joints are pre soldered, connected and sealed, meaning all you have to do is connect to the power supply which takes seconds. The AC power input cable is a generous 1m long and it unterminated for your local connection. Also included are 40 mounting clips and a spare end cap if you wish to adjust the length. Adjusting TuffStrip Pro10 to length is easy as it can be cut between every LED (that's every 16.5mm) - once cut, replace the end cap and seal with silicon and it's ready to go. A single row of warm white TuffStrip Pro mounted in ALU16 aluminium profile.